The Gantom 7 packs seven-color output into a tiny package. 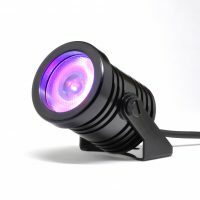 With a native 13 degree beam angle, this LED spotlight produces a punchy yet soft beam with homogeneous color mixing even at a close distance. 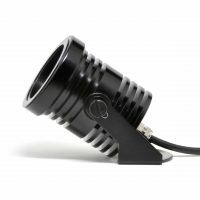 Included micro-lenses and the magnetic accessory holder offer easy beam control solutions; diffusing the spotlight to a floodlight is literally a snap. Native DMX control and a balanced, non-linear dimming curve meets the most demanding theming tasks. 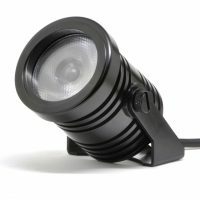 This compact spotlight features lime, amber, and ultraviolet beyond the common RGBW to achieve colors unavailable in standard LED fixtures. With the Gantom 7, lighting designers obtain a virtually unlimited color palette in a compact and efficient 7-Watt LED fixture. Full spectrum output with 7 LED colors. Multiple color profiles selectable (RGB, RGBA, RGBW, RGBAWUv, RGBAWLUv). Color control via DMX512 or DMX Programmer app. Precision-tuned non-linear dimming curve and color balance algorithm.